The Jordan River, in the state of Utah, United States, is a river about 51 miles long. Regulated by pumps at its headwaters at Utah Lake, it flows northward through the Salt Lake Valley and empties into the Great Salt Lake. Four of Utah's six largest cities border the river: Salt Lake City, West Valley City, West Jordan and Sandy. More than a million people live in the Jordan Subbasin, which is the part of the Jordan River watershed that lies within Salt Lake and Utah counties. Big Cottonwood, Little Cottonwood, Red Butte, Mill, Parley's, and City creeks, as well as smaller streams like Willow Creek at Draper, Utah, flow through the subbasin. The Jordan River Parkway along the river includes natural areas, botanical gardens, golf courses and a proposed 40-mile (64 km) bicycle and pedestrian trail, much of which has been completed. The earliest recorded diversions out of the Jordan River were in 1850 by the Bennion Mill at 5 cubic feet per second and the Gardner Mill Race at eleven cubic feet per second. In 1853, the North Jordan Irrigation Company extended the Gardner tailrace to a point near Taylorsville, enlarging the canal to carry 125 cubic feet per second to irrigate 8,000 acres of land. The canal was completed in 1881. Salt Lake City completed the Jordan and Salt Lake City Canal in 1882, with a capacity of 150 cubic feet per second. The 28-mile canal provided irrigation and municipal water to Salt Lake City. 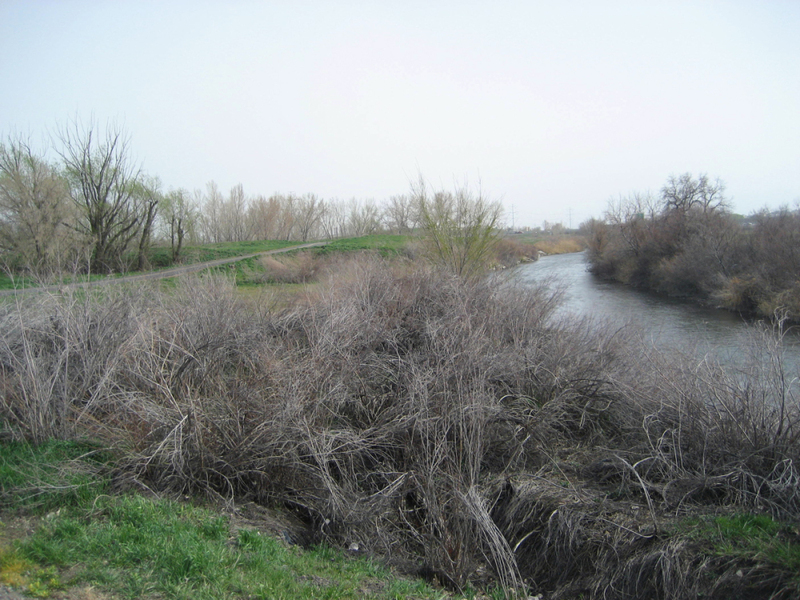 The last large canal was constructed in 1877, when the East Jordan Canal Company constructed the East Jordan Canal with a capacity of 170 cubic feet per second to irrigate 16,000 acres of land along the southeastern portion of Salt Lake County. Turner Dam at Jordan River Narrows in 1901. *Photo originally published in "Twenty-first Annual Report of the United States Geological Survey to the Secretary of the Interior 1899-1900"
Under the 1880 legislation titled "Water Rights" an act provided for the recorded vested rights to use the water and regulate their exercise. On April 14, 1883 the Salt lake County court deeded the water of the Jordan River to the five canal companies. Under the 1880 legislation titled "Water Rights" an act provided for the recorded vested rights to use the water and regulate their exercise. On April 14, 1883 the Salt lake County court deeded the water of the Jordan River to the five canal companies. The East Jordan Irrigation Company, the North Jordan Irrigation Company, the South Jordan Canal Company, the Utah and Salt Lake Canal and CSalt Lake City, each recieved one-sixth interest in the County dam, leaving one-sixth for later. This remaining sixth was deeded to the Hydraulic Canal Company September 22, 1885. This company never built a canal, so the courts deeded the rights to Salt Lake City. These priority rights in Utah Lake are called "Primary Storage Rights." 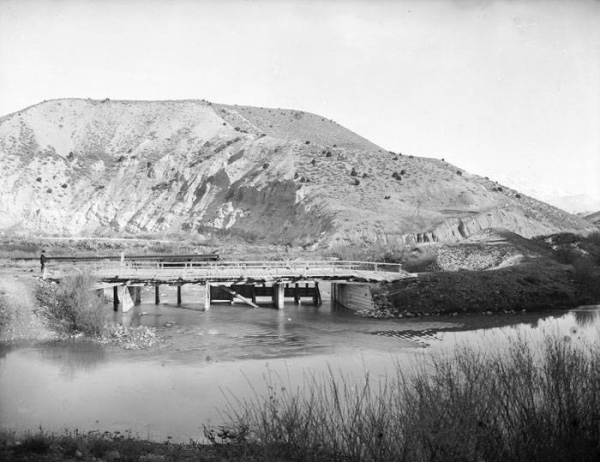 In 1899, Salt Lake City, the Utah and Salt Lake Canal Company, East Jordan Irrigation Company and the North Jordan Canal and Irrigation Company entered into an agreement to dredge the Jordan River in order to gain more water out of Utah Lake during this drought period. This joint effort forged a beneficial relationship, which would lead to the joint construction of pumps at Utah Lake and shared operations and maintenance of the facility. The Associated Canal Companies including Salt Lake City jointly manage the pumping plant through the "Board of Canal Presidents." Mousley Ditch, a small ditch on the east side of the river about 2 miles downstream from the Jordan and Salt Lake City diversion. The ditch was about a mile long and irrigated about 100 acres. Galena Ditch, a ditch about 2 miles downstream from the Mousley Ditch. Beckstead Ditch, located on the west side of the Jordan River about 6 miles from the present Turner Dam. The ditch provided water to the South Jordan Mill and irrigated a small area of farmland. Cooper Ditch, located on the east side of the Jordan River about 9 miles downstream from the present Turner Dam and about 1-mile above the North Jordan Canal diversion. Less than 2 miles long, the ditch conveyed water to the Sandy Roller Mill. The North Jordan Canal diversion is on the west side of the Jordan River about 10 miles downstream from the present Turner Dam. The Bennion Ditch diverts water from the west side of the Jordan River and provided water to a small amount of farmland and to a mill once located in Taylorsville. The Brighton Canal diverts water on the west side of the Jordan River about 18 miles downstream from the present Turner Dam. The Surplus and North Point Canal was built at a point where the Jordan River entered Salt Lake City in the 1890s. The Surplus Canal was built to relieve flooding along the banks of the Jordan River as it passed through Salt Lake City. The North Point Canal covered a large area in the northwest area to the Great Salt Lake. The Utah Lake Distribution Canal on the west side of the Jordan River. The company filed with the State Engineer on October 27, 1908, Application No. 2136, to appropriate water from Utah Lake at a rate of 135 cubic feet per second. The application was approved on January 27, 1931 and corrected May 8, 1944. A Certificate of Appropriation No. 1970 was issued, subject to prior rights and certain restrictions to use water from Utah Lake at the rate of 135 cubic feet per second from April 1 to October 31 of each year. This right is a secondary storage right in Utah Lake. As part of Application No. 2136, the Draper Irrigation Company acquired 65 cubic feet per second of Utah Lake water rights subject to prior rights under WRNUM 59-5257, Application No. A2316a tiled July 20, 1923. This is a secondary storage right in Utah Lake. The Provo Reservoir Water Users Company owns water rights in the Provo River, Shingle Creek, Weber Basin through stock ownership in the Weber Water Users Association and high Uinta lakes. The Welby Jacob members (stockholders) of the company have the highest canal on the west side of the Jordan River. The company has no water rights in Utah Lake; however, in 1987, the Salt Lake County Water Conservancy District ("SLCWCD") purchased approximately 40,000 acre-feet of Utah Lake water rights from various canal companies. Using this water, they entered into an agreement with the Provo Reservoir Water Users Company whereby the SLCWCD would deliver Utah Lake water through a pumping plant located up-stream from the Turner Dam to the Provo Reservoir Canal on the west side of the. Jordan River. A new company was formed called the Welby Jacobs Water Users Company and stock issued to the old Welby Jacobs members of the Provo Reservoir Water Users Company. In turn, the SLCWCD is entitled to Welby Jacob's share of the rights in the Provo Reservoir Water Users Company for culinary purposes. Salt Lake City had constructed the Jordan and Salt Lake City Canal as a means of increasing its water supply. Limited to City Creek and Emigration stream flows, it needed more water to meet the growing population of the City. However, Utah Lake and Jordan River water proved unsatisfactory for domestic purposes because of its quality. As the City sought new water supplies from the Wasatch Canyons, farmers had already appropriated the water for irrigation. 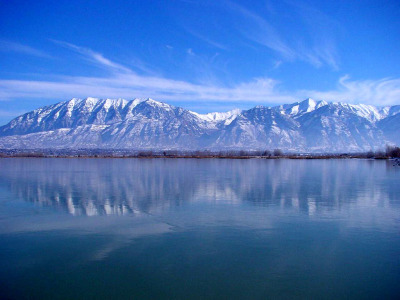 In order to gain the rights to these waters, the City exchanged its Utah Lake water for the farmer's mountain water. In 1888 the City entered into its first exchange agreement with the Parleys Water Users. The City diverted Parleys Creek water into a reservoir and pipeline at Suicide Rock at the mouth of Parleys Canyon for municipal use within Salt Lake City. In exchange, the City provided the farmers water from the Jordan and Salt Lake City Canal in proportions that would ensure late season irrigation water to mature their crops. Subsequently, at the turn of the century, additional exchange agreements were made with the farmers owning Big Cottonwood Creek water rights. Eventually, by the end of the 1930s, the City entered into exchange agreements with nearly all the water owners of the canyon streams flowing along eastern Salt Lake County. In 1995 nearly 60 percent of Salt Lake City's culinary water supply came as a result of these canyon stream exchange agreements. Each exchange agreement differs, with some requiring only the exchange of irrigation water, while others require the City to exchange irrigation water, and in addition provide culinary water at City rates or a specified amount of water free of charge.